Saint Ronan’s achieved our best result in recent years at the Thomas Trophy on Friday, finishing third overall in both girls’ and boys’ events. This was due, not just to the fact that we fielded scoring teams (six-to-score) in every age-group, but also because every single child tried hard and ran a good race. Packing tightly is key in cross country races; the further up the field, the better. Each child must focus on his or her team mate in front, striving to reach them, but also pacing themselves, and finishing strongly. Cross Country running is a tough sport! Four of the six scorers in the U9 boys’ race were Y3s, representing the school for the first time, the team scoring an impressive 138 points. Oli H (13) was first home, followed by Freddie F (15), Louis A (23), Joshua L (24), James M (28) and Freddie GR (35). Alfie A (55) and Freddie S (73) also ran well in their first outing for the school. 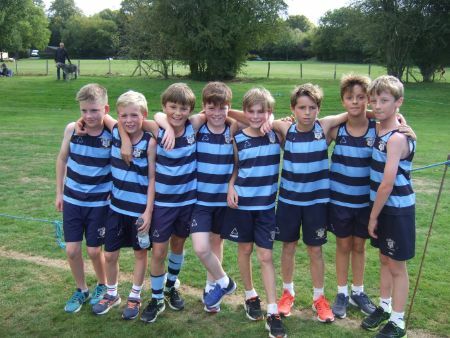 Our first four boys home in the U11 race were perfectly packed: Billy BF (24), Bertie A (25), Oscar B (26), and Max M (27), though their combined scores were still five short of the team who finished third. Jack E (57) and Jacob J (58) worked hard, a target for future races to close the gap on their team mates! Wilby W (69) and Joshua E (70) were our final pair to cross the line again, ‘packing’ well! Charlie E was our highest place finisher of the afternoon, crossing the line in a superb seventh place in the U13 boys’ race. Ellison VR (18) and Jasper S (20) were next home, with Aston B (42), Max R (57) and Jamie P (68) bringing the team score to 212. Charlie M had a good run to finish 70th. Despite not ‘placing’ in any individual team races, the combined boys’ scores resulted in third overall with 567 points behind Hazelwood (466) and Yardley Court (272). A great afternoon of running, with plenty on which to focus!